Answering the demand from the nations top 3 gun competitive shooters for a lighter trigger with all the amazing attributes of a premium CMC Trigger this is CMC's solution. 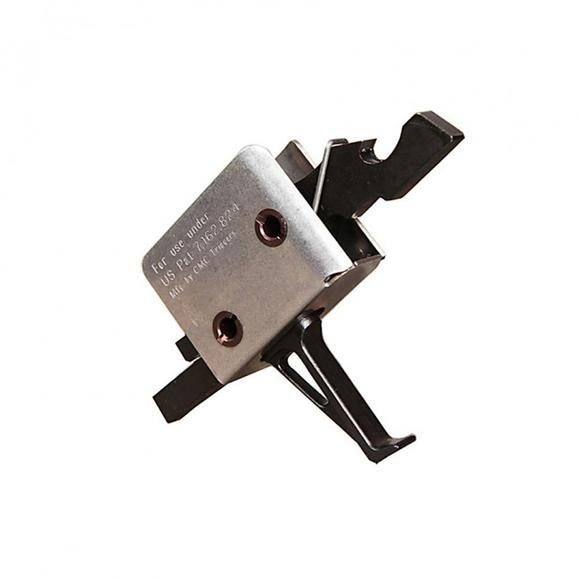 Thanks to their multi-patented designs, a fine match grade trigger pull is now an extremely simple upgrade to implement. Install the fully self-contained, ready-to-go trigger group, safety check, and it's done. Answering the demand from the nations top 3 gun competitive shooters for a lighter trigger with all the amazing attributes of a premium CMC Trigger this is CMC&apos;s solution. Thanks to their multi-patented designs, a fine match grade trigger pull is now an extremely simple upgrade to implement. Install the fully self-contained, ready-to-go trigger group, safety check, and it&apos;s done. CMC&apos;s AR-15/10 patented signature Flat Drop-in Trigger Group is the ultimate for feel and break. With the Shooters finger coming to rest naturally on the shoe, every pull is the same as the one before it. The CMC Flat Trigger Bow renders a linear feel unsurpassed by any other trigger bow shape. their critical sear engagement surfaces have a propriety machining process that renders superior surface finish and dimensional control. As compared to their competition, the techniques they use establish a 1-2 RMS surface finish as opposed to EDMing which leaves a pitty 32 RMS at best. Compared to a mirror which is 0 RMS, this is what sets the CMC Trigger apart from it competition. CMC Triggers sear engagement overlap is up to 6-8 times greater than their competitors. This provides a much safer trigger and enhances reliability.